I've been wanting skinny pants for some time now. I have/had a couple of ready-to-wear jeans, but they just don't fit me well. I have to find something that will fit my hips and thighs, which usually means the waist is too big. I do have two pairs of Clovers that I wear sometimes, but they are not the best fit. Enter knit pants that look like normal skinny pants! 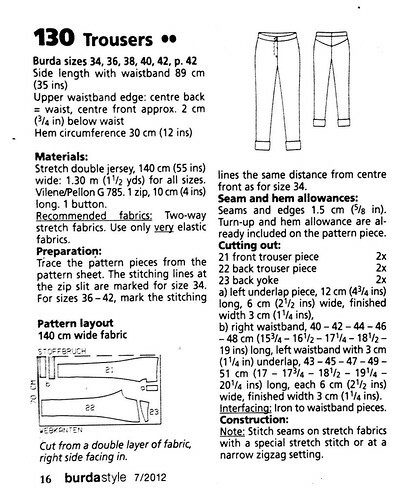 What I Love: I love that this trouser pattern is for knit, but it's not an elastic waistband! I also love the back yoke and the center back seam on the waistband, which made it much easier to make waist adjustments. 1st fly front zipper application, and it was much easier than I thought except for a couple of snaffus on my part. I used this video tutorial by Susan Khaljie. Remember to place zipper right side down. It's not mentioned in the video... it might've been self-explanatory, but when it's your first time it's hard to keep track. I made it with right side up, so I had to take it all out after I had already completed the fly front. In this particular video, the fly opens to the right instead of the left like most pants/jeans. I didn't really notice this until way later and wasn't willing to re-do yet again. Finished the bottom of the waistband with bias binding just to make it look nicer and more fun! 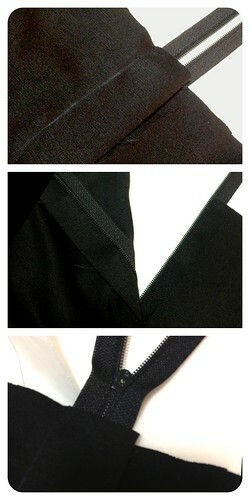 Wanted low rise (measured front and back of some pants to get the correct length) and made adjustments to the pattern. Used hook and eye instead of a button at 1/2" away from the end of the extended waistband... so it's doesn't lay as flat as I would like. I will probably add a snap at the corner. Little bit of fabric pooling at the back thigh will need to adjust for this. Did not do the turn up hem, but did a 2" machine blindstitch hem. Used blindstitch foot to help me stitch in the ditch at the waistband... it was difficult for it to go over the thicker side seams but worked pretty well has a guide. My first fly application... I was so proud until the last picture... the zipper is on backwards! Fitting pants is definitely not easy! Like I said, I have two pairs of Clovers that do not fit correctly to show for it. I'm not a muslin-ing type either... There are lots of online references on fitting; however, they didn't seem to help me with my particular issues. There are a couple of books I want to look into but haven't made any purchases yet. These fit relatively well. The front fits pretty well with no smiles or frowns other than the little bit of twisting near the knees. The back is actually not too bad except for the extra fabric along the back of the thigh. I need to do a little bit more research to fix that. I DID have front and back pockets planned for this particular pair of pants. I was going to put back pockets in the seam of the yoke and back pieces but I ended up putting the first one in backwards. After that I didn't want to mess with them anymore... plus I would've had to add black facing in case the pockets gaped and showed the bright print. After basting all the seams to get the fit correct and working on these for so long, I didn't want to go back and cut the front pockets out either. Haha... in the end these don't have pockets because I was just plain lazy, which makes me a little sad. How can you have pants without pockets?! Oh well... I only have myself to blame. I will make this pattern again. I already have the fabric pre-washed and ready to go! 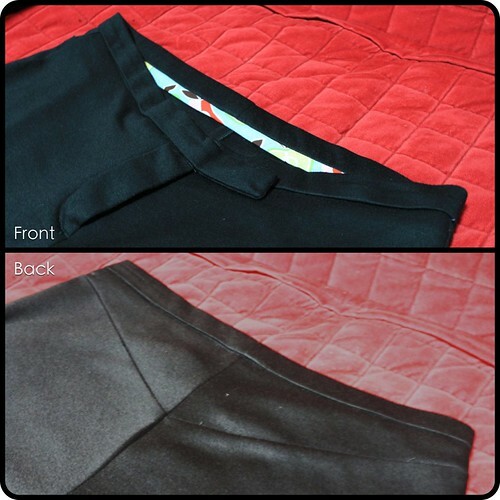 It's the same beautiful double knit that Susan used to make her beautiful skirt. I will definitely add pockets to this one! The fabric is pretty comfortable... it's a little warm but then again I live in Texas. It isn't a cotton knit, but a rayon poly blend. My Clovers are a stretch cotton, and I would say that I double knit is more comfortable. Hehe... good luck! Love these. Well done on the fly and the fit. Have you thought about a little topstitching to make it look a little more jeans like? Or maybe that's not the look you're going for? They look fab anyway. Can't wait to see the mustard ones! Thanks! Hehe... wasn't going to for the jeans look on this particular pair but maybe in a future version. I need to start my mustard ones... hopefully very soon. These look really good. What a good idea! Hehe. Thanks! They're so comfy! Love these, and tres excited for the mustard ones! :-) Let's talk Tuesday about those back-of-thigh wrinkles... I have some ideas.... I'll bring the red book too! Thanks, Susan, that would be awesome! I'm pretty excited about the mustard ones, too. Congratulations on finally finding the a perfect fitting pair of skinny pants. You look great. BTW- I like the top too.